Plastic pollution is emerging as a top threat to ocean ecosystems. By 2025, it’s been estimated that there could be 1 ton of plastic for every 3 tons of fish in the ocean. Plastic debris affects nearly 700 species worldwide through entanglement and ingestion, alters natural biological and chemical processes, and provides a means for the introduction of toxins into the food web costing national economies millions each year. The majority of this debris comes from land-based sources (e.g., plastic manufacturers, processors, landfills, sewage overflows, litter). As the issue of ocean pollution is increasingly recognised as a global concern, more attention is being given to the development of what’s been termed “plastic pollution law”. Specifically, it is being questioned whether existing law and policy mechanisms are sufficient to address the threat of plastic pollution. Arguably, it is an initiative that warrants participation by every country. There are those that are of the view that current environmental law is incapable of adequately addressing growing threats, such as plastic pollution, and solutions will require a complete paradigm shift. New Zealand is, by global standards, sparsely populated, and a level of population that is less than half the OECD average and higher than only Australia, Iceland, Canada and Norway. That means the human footprint is comparatively small in New Zealand – and it is consequently sobering to consider just how much impact people have had on New Zealand’s environment in such a short time. New Zealand’s National Institute of Water and Atmospheric Research or NIWA is a Crown Research Institute of New Zealand. Established in 1992, NIWA conducts commercial and non-commercial research across a broad range of disciplines in the environmental sciences. NIWA’s website states “New Zealand’s record on biodiversity is one of the worst anywhere. We have one of the highest extinction rates, and we currently have more threatened species than any other nation on Earth. A 2007 biodiversity assessment found 2788 native species at risk. The International Union for the Conservation of Nature rates 37 per cent of our 215 native birds as threatened. Thirty-four per cent (797) of our plants are considered to be under some level of threat. Sixty-eight per cent of our freshwater fish are threatened (four of the five species in your whitebait fritter are on the endangered list), and the freshwater crayfish and mussel are also in danger”. That’s all background to the concern raised by a report suggesting that seabirds are at more at risk of dying due to plastic in New Zealand than anywhere else in the world. Seabirds are particularly vulnerable to eating plastic because they are surface feeders, spotting food from the air and swooping down on it, scooping it up and swallowing it before the mistake is realised. 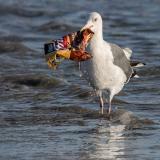 Seabird chicks and adults face starvation when their stomachs fill up with plastic rather than food. The solution proposed by Forest & Bird (New Zealand) is that the government should ban single-use plastic bags and commit to further research into how marine life is affected by plastic in New Zealand waters. … what are your thoughts on the issue of plastic pollution? Is it an issue? How big is that issue? And what do you see as the most cost-effective way of dealing with it?